Cedar Fair Entertainment Company (NYSE: FUN) has reported financial results for the year ended December 31, 2017. The Company reported record full-year net revenues of $1.32 billion, up 3% from 2016; net income of $215 million, or $3.79 per diluted limited partner (LP) unit, up $38 million from a year ago. Attendance at Cedar Fair’s parks was a record 25.7 million guests, a 2% increase from 2016; average in-park guest per capita spending increased 1%, to a record $47.30. Expanded special events in the fourth quarter resulted in a 19% increase in fourth-quarter net revenues and a 14% increase in fourth-quarter Adjusted EBITDA when compared with the same quarter last year. Full-year Adjusted EBITDA of $479 million declined $2 million, or less than 1%, from the record Adjusted EBITDA achieved in the prior year, due to higher operating costs combined with lower than anticipated attendance growth. Sales from advance purchase commitments, including season passes, through the end of January are up 10% from the same time last year, driven by a strong capital program for 2018. For the full year ended December 31, 2017, Cedar Fair generated record net revenues of $1.32 billionand net income of $215 million, or $3.79 per diluted LP unit, compared with net revenues of $1.29 billion and net income of $178 million, or $3.14 per diluted LP unit, in 2016. Driving the $33 million, or 3%, increase in net revenues was a 2%, or 619,000-visit, increase in attendance to a record 25.7 million visits and a 1%, or $0.40, increase in average in-park guest per capita spending to a record $47.30. These increases were slightly offset by a $2 million decrease in out-of-park revenues to $144 million. 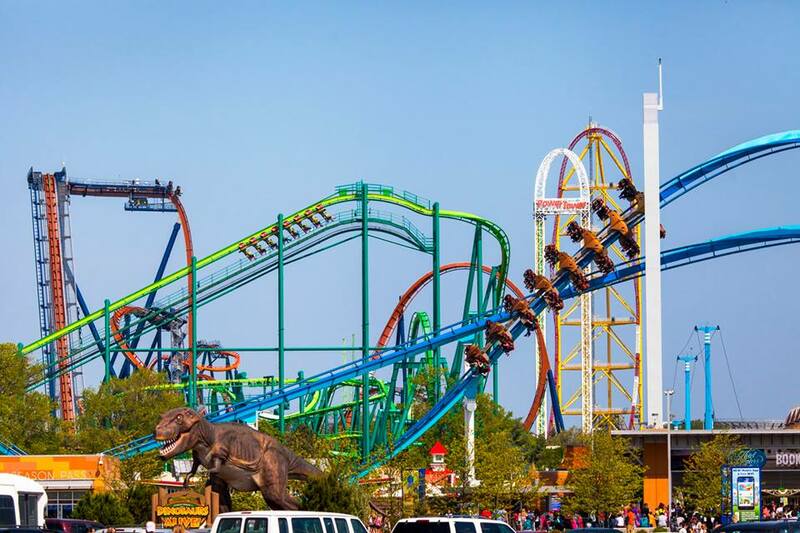 The Company attributes the increase in attendance to its strong capital program, including Mystic Timbers, a world-class wooden roller coaster at Kings Island, and the expansion of its two separately-gated water parks at Knott’s Berry Farm and Cedar Point. The Company also introduced and expanded its immersive special events, such as a month-long celebration at Canada’s Wonderland in honor of that country’s 150th anniversary, the expansion of the Company’s daytime Halloween events across all of its parks and the introduction of three new WinterFest celebrations in November and December. Excluding a non-core, stand-alone water park that was closed in September 2016, attendance on a same-park basis for 2017 increased 3%, or 856,000 visits. Average in-park guest per capita spending improved as a result of increases in both pure in-park spending and non-season pass admissions per capita spending. The food and beverage category led the increase in pure in-park spending, driven by the continued growth of the all-season dining and beverage programs. The increased non-season pass admissions per capita spending is a result of the high value the Company’s guests place on its product offerings, particularly in its new rides and attractions, and group entertainment facilities. Revenues from the Company’s resort accommodations, which is the primary source for out-of-park revenues, were comparable with last year. The decrease in out-of-park revenues was the result of prior-year revenues received from a Super Bowl 50 special event and the timing of other miscellaneous revenues. Operating costs and expenses for 2017 totaled $863 million, up $35 million, or 4%, from the prior year. The increase was primarily attributable to an increase in labor costs due to higher market/minimum wage rates, higher operating costs and supplies related to new multi-week special events, an expanded multi-year marketing initiative to more aggressively market certain parks as regional destinations, and a non-recurring legal settlement. Although the cost of food, merchandise and games also increased as a result of higher volume, these costs as a percent of sales were comparable with a year ago. Adjusted EBITDA, which management believes is a meaningful measure of the Company’s park-level operating results, was $479 million, down less than 1 percent, or $2 million, when compared with the record Adjusted EBITDA achieved in 2016. The decline in Adjusted EBITDA resulted primarily from the increase in operating costs and expenses noted above combined with lower-than-anticipated attendance growth. While the Company reported record attendance in 2017, its growth was lower than anticipated due to more than a few instances of unfavorable weather on some of the Company’s peak attendance days in July and August – including Labor Day weekend. See the attached table for a reconciliation of net income to Adjusted EBITDA. As of December 31, 2017, Cedar Fair had $735 million of variable-rate debt (before giving consideration to fixed-rate interest rate swaps) and $950 million of fixed-rate debt (excluding amounts related to debt issuance costs), no outstanding borrowings under its revolving credit facilities and cash on hand of $166 million. The Company’s cash flows from operations and credit facilities are expected to be sufficient to meet working capital needs, debt service, planned capital expenditures and distributions for the foreseeable future. In addition to the new rides and attractions, the Company’s flagship park, Cedar Point, will look to strengthen its appeal as a multi-day family destination, when the historic Hotel Breakers opens its new five-story, 158-room addition on the park’s mile-long beach. The Company also continues to invest in its unique culinary experiences with new or upgraded restaurants and catering areas at five of its parks. These facilities will provide a more diverse array of regional specialty foods, cater to increased group business, and accommodate more food-themed special events. For families with young children, the Company is expanding its successful “Pre-K Pass” program in which children aged 3 to 5 may receive a free season pass. In 2018, Cedar Point, Carowinds, Kings Dominion and three other parks will offer the free Pre-K season pass to make it easier for younger families to visit the parks repeatedly throughout the year. Zimmerman also noted that the Company continues to advance important long-term initiatives that will position it to grow well into the future. In 2017, Cedar Point launched a new multi-year marketing campaign to position this park as a true regional resort destination. “The brand research and positioning we performed this year clearly point to a new population of guests who will see Cedar Point as the highlight of a multi-day stay they can’t get anywhere else. The entire family can enjoy the park, play on the mile-long beach, stay at the historic Hotel Breakers, and sample a diverse array of food and entertainment to create an experience like no other, creating memories that last long after the return trip home,” said Zimmerman. In addition, the Company recently finalized a deal to build a 129-room, SpringHill Suites hotel adjacent to Carowinds in Charlotte, NC. The hotel is scheduled to break ground later this year and should come on line in late 2019. “This opportunity to activate more of our undeveloped land not only broadens our park offerings and enhances the guest experience, but will also provide us additional hotel revenue when the park is closed,” added Zimmerman.